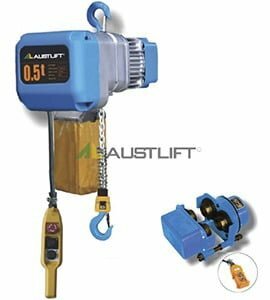 The electric chain hoist is probably one of the most common features in any heavy lifting environment. You will find them in every industry from car assembly plants, retail warehouses and airports. At All About Lifting & Safety, we stock various different electric chain hoists that cater to every single heavy lifting need. Whether you require one for light, general lifting or a stronger one for high-speed lifting of heavier loads, we have you covered. It can be difficult to decide on an electric chain hoist by yourself, that’s why our qualified team of professionals will guide you through each part of the electric chain hoist specification to make sure you have one that fits your needs perfectly. When All About Lifting & Safety started, one of the founding principles was using high-quality components to then get the highest-quality product. Today, we choose products that contain only the best components to save you time, maintenance and hassle down the road. Power chain: usually we stock chains made of alloy steel for the ultimate strength and durability for your hoist lift. Varying suspension systems: our suspension systems range in speeds to cater to the speed and style of lifting your require from the hoist lift. At All About Lifting & Safety, we are Australia’s leading supplier of heavy lifting material and electric hoist lifts. Once you get in touch, our team of professionals will start straight away with a consultation to find out exactly what it is you’re looking for, from voltage to lifting height to weight capacity. This tailored selection process ensures that you get the right fit, right away. With 80 years of combined experience in the lifting and safety industries we are the suppliers of choice for all types of electric chain hoist plus other key lifting and safety equipment. We also provide repair, testing and maintenance services on-site for your convenience, as well as at our multiple locations across South East Queensland and in New South Wales. Give us a call today to starting talking to our experts about which electric chain hoist is right for you!